I’m sensing a theme here…;) But do we REALLY ever get tired of it? Heck no! Just remember our Santa Hat rule! Little “Princess” Sashi (aka, “Devil Dog”) all decked out for the holday. Linda, thanks for the holiday chuckles! Look Bella, I think it’s Santa! I think you’re right, Tes!! Any Sheltie that is subject to the indignity, jokes & chuckles of a Santa hat this holiday season, must be given at least one extra cookie for each “offense”…two cookies if you preserve it forever on film or video. Happy Holidays to you too Bruce & your buddy Snickers! Forget the elves…Santa needs Shelties! Too cute Sharon! Poor Shane, now all the other Shelties will laugh & call you names. Love the jingle bells Holly! Here is a great gift giving suggestion for the Sheltie lover in your life. Diane also has other great non-holiday artwork, t-shirts, sweatshirts & tote bags. This new design is really sweet! 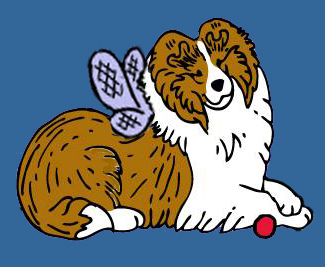 Sheltie Nation members should recognize Diane’s work – just look at our logo Sheltie! Vcurve, it looks like your Sheltie is waiting to help you decorate!